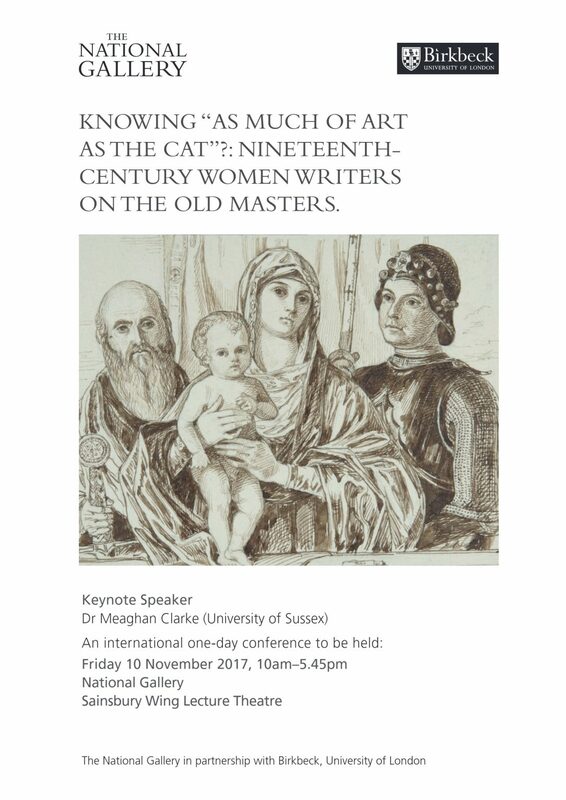 Maria Alambritis, AHRC Collaborative Doctoral Award Candidate (Birkbeck/National Gallery), has kindly written the report for the stimulating Nineteenth-Century Women Writers on the Old Masters conference at National Gallery on 10 November, 2017. In a recent collaboration between the National Gallery and Birkbeck, the conference Knowing “as much of art as the cat”? 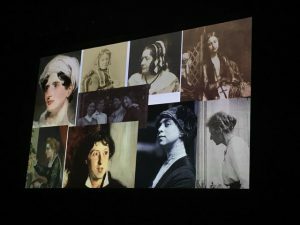 : Nineteenth-Century Women Writers on the Old Masters brought attention to the currently evolving field of research into the role of nineteenth-century women writers as influential interpreters of the visual arts in Britain. One of the exciting outcomes to emerge from the National Gallery/Birkbeck Collaborative Doctoral Partnership ‘Modern Mistresses on the Old Masters’, this international one-day event, organised by Dr Susanna Avery-Quash (Senior Research Curator in the History of Collecting, National Gallery) and Professor Hilary Fraser (Dean of Arts & Geoffrey Tillotson Chair of Nineteenth-Century Studies, Birkbeck), shone light on the numerous and neglected contributions by women to the development of art history during the discipline’s formative years. 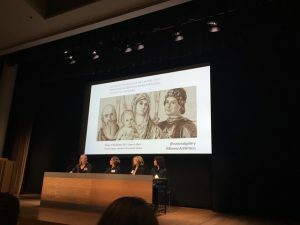 With an emphasis on English-speaking women as disseminators of knowledge about Old Master paintings and historic painting techniques during the Victorian era, the conference brought together scholars from literary, art historical and museum backgrounds, with both Victorian and Renaissance specialisms, foregrounding the rich interdisciplinary nature of the topic. The keynote delivered by Dr Meaghan Clarke (University of Sussex) set the scene, asking the crucial question ‘where are the women who shaped art history?’. The resonance with the pioneering words of the sadly recently passed Linda Nochlin (1931-2017) could not be missed, emphasising the legacy of Nochlin’s work in the conference’s core interrogation of the on-going absence of women from the writing of the history of art history itself. Discussing the development of this scholarly field as a whole, Clarke drew on recent work which has expanded our understanding of women as not only popularisers of art, but also originators and collaborators, contributing to art historical knowledge using a range of forms. Clarke emphasised the importance of travel and translation as key strategies of women’s professionalism, a prominent feature in the careers of all the women spoken of across the papers of the day. Clarke also presented a fascinating case study in the example of Christiana Herringham (1852-1929), who developed nineteenth-century knowledge of the tempera technique via her copies after the Old Masters. The first panel session chaired by Susanna Avery-Quash featured three papers focusing on the key figure of Elizabeth Eastlake, née Rigby (1809-1893), a prolific art writer and wife of the National Gallery’s first director Sir Charles Eastlake. Professor Julie Sheldon (Liverpool John Moores University) addressed the ways in which Elizabeth Eastlake exerted an authoritative authorial persona, despite the majority of her writing being written anonymously, pseudonymously or in collaboration. In fact, the anonymous convention of journalistic writing in Lady Eastlake’s generation allowed her freedom to express herself boldly, often employing a man’s voice to convey her forthright opinions. Eastlake’s cultivation as an authoritative source on the arts was successful, as demonstrated in Sheldon’s salient point that the majority of her literary contributions were commissions, not pitches – demonstrating how ‘her knowledge was sought, not offered’. Dr Lene Østermark-Johansen (University of Copenhagen) took Lady Eastlake’s prediction that Giovanni Battista Moroni’s Il Tagliapanni (1565-70, National Gallery, London, NG697), purchased in 1862, would become ‘a popular picture’, to give a tour-de-force account of the history of this painting’s reception. Under the female gaze, Il Tagliapanni transformed from a portrait of a tailor at his daily work into the universally attractive poster boy of art history. Tracing his ubiquitous appearance in a range of surprising, strange and often humorous guises – an essential call during ladies’ shopping visits to London, the subject of tableaux vivants, inspiring characters in Henry James’ and George Eliot’s fiction – Østermark-Johansen illuminated how women acted as disseminators of the Old Masters not only as writers and critics, but as viewers and consumers of art. Professor Patricia Rubin (New York University) brought together the seeming unlikely pairing of George Eliot and Lady Eastlake. Though these two women were of very different social and religious backgrounds, they both drew on the same canon of mid-century taste in the Old Masters. Rubin emphasised the importance of comparing women’s private and published writings to understand the nuances of specific terms used in relation to art and explore how these two women lent their own considered and specialist voices to contemporary debates on what constituted a ‘great’ painter. Hilary Fraser chaired the second panel, which focused on the important contributions of three individuals: Anna Jameson (1794-1860), Mary Philadelphia Merrifield (1804-1889) and Maria Callcott (1785-1842). A unifying theme of this session was how these women’s contributions resulted from their particular way of ‘seeing’ Old Master artworks in person. Professor Diane Apostolos-Cappadona (Georgetown University, Reiss) gave a detailed account of Anna Jameson’s tremendous success and influence as an art writer, drawing on her particular reading of and appreciation of Raphael’s Madonnas. Of the Sistine Madonna of Dresden, Jameson said: ‘I cannot see this picture as merely a picture – for me it is a revelation’. Situating Jameson’s interpretations of Raphael’s work amongst those of Alexis-François Rio and Lord Lindsay, Apostolos-Cappadona showed despite Jameson’s dismissal by figures such as John Ruskin, her work greatly outsold and had a wider reach than her male contemporaries. Dr Zahira Véliz Bomford (Museum of Fine Arts, Houston) examined Mary Philadelphia Merrifield’s published contributions to knowledge of Old Master painting techniques and materials in light of the myriad networks she cultivated with key figures in the institutional art world. Drawing on Merrifield’s personal correspondence, Bomford demonstrated the importance of networks in enabling Merrifield to conduct meticulous archival research abroad, while simultaneously managing the daily responsibilities of being a Victorian wife and mother. Merrifield’s careful combing of Italian archives resulted in her translation and publication into English of numerous important Renaissance painting tracts, and emphasised Merrifield’s use of translation as a form of making lost knowledge accessible again. Dr Caroline Palmer (Ashmolean Museum) considered Maria Callcott’s networks amongst both art authorities and the practising artists of her day. The intersecting nature of her roles as collector, writer, tastemaker led her to become an acknowledged authority on the ‘primitive’ art of Germany and Italy. Though her declining health prevented Callcott from pursuing a career as an art writer to the full, the salon in Kensington over which she presided acted as a forum in which her connoisseurial expertise on both Old Masters and contemporary art was both disseminated and sought. The final panel of the day chaired by Dr Stephen Bending (Director of Southampton Centre for Eighteenth-Century Studies) took the time period of the conference to the very end of the nineteenth century and into the beginning of the twentieth centuries, examining women writers whose work encompassed the increasing specialism of the art press, aestheticism, and decadence, and focused on the painted and sculpted forms of Old Master artworks. Professor Patricia Pulham (University of Surrey) drew on Vernon Lee’s supernatural short stories ‘A Seeker of Pagan Perfection’ and ‘Dionea’ to ask what place fiction played in art history during the nineteenth-century. Pulham drew on the proliferation of the figure of the Madonna in Lee’s stories as a trope by which Lee invoked the Old Masters to blur the distinction between pagan and Christian art. Emphasising the place of the city of Rome, as much a character in Lee’s stories as any other, Pulham demonstrated that for Lee, knowledge of art history emerges as a ‘psycho-geographical impulse’. My own paper looked at the proliferation of popular serialised artists’ monographs in the late-nineteenth and early-twentieth century English art press and women’s contributions to such series via monographs on Old Masters deemed unpopular and ‘difficult’ to appreciate. Taking the case study of Andrea Mantegna, I discussed the work of Julia Cartwright (1851-1924), Maud Cruttwell (1860-1939) and Nancy Bell in charting the artist’s emergence into the art historical and popular consciousness, through the intertwining of their writing with Mantegna’s increasing public visibility via a series of acquisitions into the National Gallery’s collection. Dr Francesco Ventrella (University of Sussex) closed the conference proceedings with a detailed and engaging analysis of Maud Cruttwell’s struggle for professional recognition amongst the conoisseurial circles of her day. Tracing both the rivalry and recognition she received from figures such as William von Bode and Allan Marquand, Ventrella examined the influence of physiological aesthetics on Cruttwell’s connoisseurship and her specialisation on Old Masters Antonio Pollaiolo and Luca della Robbia, artists who exceeded the medium of painting. The conference proceedings will be published in a special issue of Birkbeck’s open access peer-reviewed journal 19: Interdisciplinary Studies in the Long Nineteenth Century to appear in Spring 2019, edited by Susanna Avery-Quash, Hilary Fraser and Maria Alambritis. 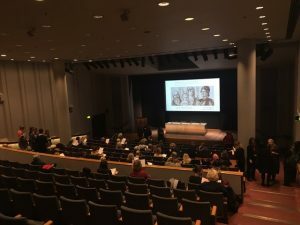 The conference formed part of a collaboration between the National Gallery and Birkbeck, University of London that also includes Chawton House Library, Hampshire, and the Southampton Centre for Eighteenth-Century Studies, University of Southampton. It followed a one-day event held at Chawton House on 25 February 2017. Please see here for the conference programme and speaker biographies and abstracts.